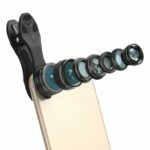 This APEXEL 6 in 1 Phone Camera Lens Kit is specially designed for photography enthusiasts. 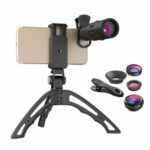 It includes 210° fisheye lens, 2X telephoto lens, star filter lens, 120° wide lens, 15X macro and CPL lens, to meet your different photography demands. Simply clip the lens on your phone camera and discover the beauty of the visual world. 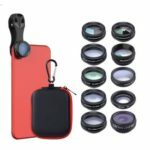 6 excellent lenses with different features in one kit, you will see a more beautiful and marvelous world. Brings a strong perspective effect and enhances the attraction. Similar to a monocular telescope, best for distant details and unapproachable shooting subjects. It can change light source into a star point, to create a romantic atmosphere and increase the artistic effect of the photo. Offers amplifying field of view that enables you to capture those wide landscapes in the cramped space. 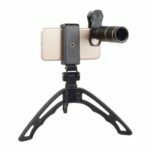 Allows to capture the object in a very short distance without perspective distortion, perfect for shooting flowers and insects. Portable, removable and solid clip-on design that attaches to almost all mobile phones including iPhone, Samsung, HUAWEI, etc.